Description - Generally the grey wolf is a grizzled grey but colour varies from white to black. The ears are erect and the tail is bushy and black tipped. The male is larger than the female and average weight is 55-130 pounds. 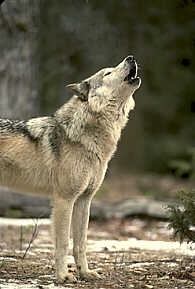 Distribution - The grey wolf, also known as the timber wolf, prefers the open tundra and forests of British Columbia. Although they once inhabited most of North America, now distribution occurs in only Alaska, Canada, and parts of the U.S.A. Human fear, superstition, and outright hatred of this animal decreased its population drastically and eradicated it from 50% of its former range. Biology - The wolf is a very social animal who mates for life and lives in packs of 2-15. The strongest male is usually the pack leader; all members of the pack care for the young which helps unite the pack. An average of 7 pups are born to each female in April-June. Usually hunting at night, they feed primarily on large mammals by chasing down their victims either slashing tendons or driving it back to waiting pack members. Even though they kill only to survive, studies show that wolves play a key role in drastically decreasing the number of ungulates, sometimes beyond the rate of replacement, in any given area. The wolf's only important predator is man. Tracks - The grey wolf generally travels in packs. During the snowy winter months they tend to follow the trail made by the leader to conserve energy. The front foot is larger than the rear and the toes are often splayed particularily in soft ground. The front foot track is rounded with four toes with the claws evident and the heel pad having a inverted V-shape, whereas the rear is slightly more oval with a triangular shaped pad.